This week: The Sandman trade paperback #3, Dream Country, covering issues #17-20. Dream Country plot summary: These four independent short stories take place largely, though not completely, outside the main narrative. The first, “Calliope,” concerns the imprisonment of the Greek muse Calliope by blocked writer Richard Madoc, who is ultimately punished at the hands of Calliope’s former lover, Morpheus. “A Dream Of A Thousand Cats” finds a Siamese cat sharing a tale she learned from a feline Dream, about a lost time when cats were the rulers of all, including the puny humans who served them; she believes cats can reclaim that world if they dream it en masse. The World Fantasy Award-winning “A Midsummer Night’s Dream” features the debut performance of a new play by “Will Shaxbeard,” commissioned by Dream and performed for an unusual audience that bears a striking resemblance to the play’s fairy characters, including the rapacious Puck. And “Façade” finds Silver Age superhero Element Girl, a.k.a. Urania “Rainie” Blackwell, retired, alone, and depressed, leading to a revelatory visit from Death, who’s passing by. Genevieve: In the introduction to his script to artist Kelley Jones, Neil Gaiman characterizes the issues that will compose Dream Country as short stories, and more significantly, as a respite for him after the draining experience of writing The Doll’s House. “I wanted to do a few totally self-contained stories I could get over with in 24 pages,” he writes. “The worry that I didn’t have a clue how Doll’s House was going to end… was getting pretty nerve-wracking.” Dream Country is just as much a respite for readers as for the author, though this being Sandman, that does not mean these four issues are trivial or tossed-off in any way. Much like “Men Of Good Fortune,” which served as a breather between major events in The Doll’s House, the stories in Dream Country are another, more extended breather between major events in The Dreaming. (This isn’t the last time Gaiman did this throughout Sandman’s run, though this is the only one of the series’ short-story collections I’ve personally read before.) Appropriately, the seeds for what’s perhaps the most notable of Dream Country’s four issues, “A Midsummer Night’s Dream,” were planted in “Men Of Good Fortune,” and “Midsummer” also introduces a character who will have a major impact on future events in the overall narrative. Even when Gaiman is taking a break, he isn’t idling; there’s forward momentum in these stand-alone issues, even if it isn’t narrative momentum. The story of Calliope’s captivity by Madoc doesn’t have any direct correlation to events in The Dreaming, but her liberation by Morpheus—which is delayed somewhat by his own imprisonment in The Sandman’s opening issues—is very much tied to his status as master of stories: He buries the idea-starved Madoc under an avalanche of inspiration, which drives the author to madness, until he frees Calliope. Morpheus is somewhat of a peripheral figure in the issues that make up Dream Country—to the point where he doesn’t even appear in #20, “Façade”—but they all take place within his realm of stories, dreams, and imagination (the “dream country,” if you will). Noah, in the kickoff Back Issues you wrote on Preludes & Nocturnes, you posited Morpheus as a narrative shadow of Neil Gaiman, which “Calliope” certainly bears out in some ways. What do you think Gaiman is trying to convey in this story, and why do you suppose he chose to convey it on the outskirts of the overall Sandman narrative? Noah: I think you got it right when you pointed out the forward momentum of these stories. While these stories are simple, in the sense that they only last an issue each and are narratives in themselves, there’s so much going on in both the foreground and the periphery. As usual, Gaiman conveys a whole bunch of stuff, all at the same time. First, there’s the main story, where Gaiman recreates a myth. Madoc’s imprisonment of Calliope is similar to Bellerophon’s attempt to fly to the top of Mount Olympus, or Ravana misusing Shiva’s power in the Ramayana. All three men come into contact with the supernatural, and their abuse of a power that is beyond them leads to ruin. Calliope is an old archetype, and Gaiman’s use of a muse (i.e. an ancient narrative concept) as the protagonist shows us he’s very aware of that. We’ve already seen the idea that stories are endlessly retold in The Doll’s House, in his depiction of The Corinthian and Fiddler’s Green. Gaiman is clear that both of them have lived in many people’s dreams and nightmares, just as stories find new contexts and voices to be retold. These are ideas that come up in the overall Sandman narrative, but putting the story on the outskirts makes it easier to draw direct parallels between the myth of Calliope and its previous iterations. But Gaiman’s retelling here also involves Morpheus, which lets Gaiman both flesh out the character’s backstory and hint at what’s to come, all within this little tale. We learn about his relationship with Calliope, and his son, Orpheus, whose own story is the stuff of Greek legend. But there’s also character growth here as well. Morpheus forgives Calliope at the end, saying, “I have learned much in recent times…” It’s a great way of drawing a contrast between Morpheus before and after his imprisonment, and it underscores that he is a changed being. The fact that his heart is now and few sizes larger is important for the next volume, Season Of Mists, and Gaiman is able to cement that shift in “Calliope,” so he doesn’t waste any time when he gets back to the larger Sandman narrative. In that sense, the story can be read as pure exposition, but that would completely ignore how wonderful it is as its own story. But Genevieve, what did you think Gaiman was trying to get across here? And how do you think it related thematically to the next story, “A Dream of A Thousand Cats,” which seems even more distant from the overarching plot? Genevieve: Well, I think the aforementioned script note to Kelley implies that Gaiman may have been struggling with inspiration during The Doll’s House—either a dearth or an overabundance thereof—so it makes sense that he’d follow that experience with a story about a muse and a writer who is a conduit for that muse. “A Dream Of A Thousand Cats” follows a similar, yet ultimately different, thread of inspiration and storytelling, and also of the tangible, transformative effects of intangible ideas. The story Cat-Morpheus tells the Siamese, and that she then passes on to her feline congregation in the graveyard, literalizes this idea: Simply by dreaming it as one, humans were able to overthrow their feline overlords, and therefore, cats should be able to reverse that, if only they weren’t too resolutely independent to band together and dream as one. It’s a fantastical—and yes, cute—parable about one of the oldest and most resilient creative ideals, the belief that ideas and imagination have the power to effect change. The history of humanity, everything from religion to politics to art, comes down to stories, to narratives that shape how people think and act. Revelation leads to wisdom, which has the power to realize justice. Pretty heady stuff for a story about kitty cats, right? That’s the thing about The Sandman: As with dreams, we can read into it as much or as little as we want, and interpret it different ways. “A Dream Of A Thousand Cats” could also be about the significance of the oral storytelling tradition, or a metaphor about organized religion, or even just a love letter to cats, if you’re inclined to read it that way. The best stories work on several levels, which means they can sustain multiple readings and engender discussions such as this one. The next issue in Dream Country doubles down on this, being a multi-layered story centered on a text and writer that have long invited multi-layered analysis. “A Midsummer Night’s Dream” is so meta it hurts, and could probably sustain on its own a couple weeks’ worth of discussion in a college Shakespeare course. “Midsummer” can be a somewhat confusing in the way it bounds between perspectives, from the action backstage to the onstage performance of the titular play, from the real fairies in the front row and peanut gallery to the characters they inspired. It’s a lot to keep track of, especially if the reader isn’t well-versed in the text of A Midsummer Night’s Dream, but all those unwieldy strands come together in the second-to-last page, a strikingly cinematic progression that sees the “real” Robin Goodfellow/Puck remaining behind after his fairy brethren return to their realm and reciting his character’s concluding speech from the play, complete with a blackout panel at the end. I know Puck will turn up again in Sandman, though not having read that far in the series, I don’t know exactly how. But this page makes it pretty obvious that when he does, it’s probably not going to be a good thing. Noah, how do you interpret Puck’s introduction in this issue? Noah: I actually haven’t read far enough along to encounter Puck again either, so his return is news to me, though not surprising. What I love about Puck’s soliloquy here is how villainous he is, and I’m totally with you about how the panels portend bad things to come. Puck is usually played as simply mischievous, but Charles Vess draws him here with burning red eyes and long, claw-like hands. This is not the Puck you saw your friend play in high school. He’s dangerous, and that blackout in his last panel underscores that danger. This gets back to the idea of retelling stories. Shakespeare’s plays have been put on innumerable times, and all actors creates their own Hamlets, or Desdemonas, or Pucks. Gaiman is no actor, but this is his Puck, and this iteration is a bit scarier than how we usually see him. This particular story is my favorite from Dream Country, mostly for how well Gaiman juggles the many plotlines. I mentioned earlier that “Calliope” gives us proof that Morpheus is changing as a character, and his discussion with Titania here shows the seeds of that change. He actively questions himself, something the other Endless don’t seem to do. He’s clearly saddened that the people of Faerie are forsaking the world of men, and his response is to engender a story, a dream, that reminds both worlds of how much they once were intertwined. There’s a tragedy here that I think sometimes can be overlooked when we’re busy being dazzled by the workings of the plot. But loss is an important theme in these stories, and the last one, “Façade,” brings that home with a woman whose metamorphosis has destroyed her humanity. Rainie Blackwell’s ability to change her body into any element is a curse. Unlike us regular humans, whose forms are relatively static, she’s in a sort of constant flux, with no one particular type of body being her “normal” one, her real one. We have a tendency, especially in Western thought, to separate ourselves from our bodies, identifying our “true nature” with our souls, or intellects, etc. “Façade” pokes holes in that distinction. But there’s also the idea that our identities are always changing. Death chastises Rainie for not accepting that change when she says, “You people always hold onto old identities…” Rainie has lost her old self, and Death’s advice is to move on, and get comfortable with her new one. This may look like it clashes with my point about bodies above, but I actually think they’re complimentary ideas. Rainie could easily be replaced with a quadriplegic, or the child she sees in the wheelchair while at lunch. Many people whose bodies have dramatically changed have psychological issues involving identity, and the way they move forward is to accept their new situations. What do you think of this idea of “old faces and masks,” as Death puts it? Do you think Gaiman is onto something in using Rainie as an extreme example of the human condition? Genevieve: I’m pretty sure Rainie’s issues are also meant to be a commentary on the superhero tradition, which fits with this collection’s focus on storytelling. (Superheroes being modern-day myths.) It’s too bad we don’t have any of our Silver Age experts in this round of the discussion, because I’m sure we’re missing plenty of nuance here in regards to Rainie’s history as Element Girl, a character Gaiman subsequently revisited in a 12-page Metamorpho story he did with Mike Allred for Wednesday Comics. But even superhero novices like ourselves can recognize the identity issues at play in the very concept of a superhero, which is almost always dependent on things like secret identities and masks, inviting questions of what constitutes one’s “true” self. 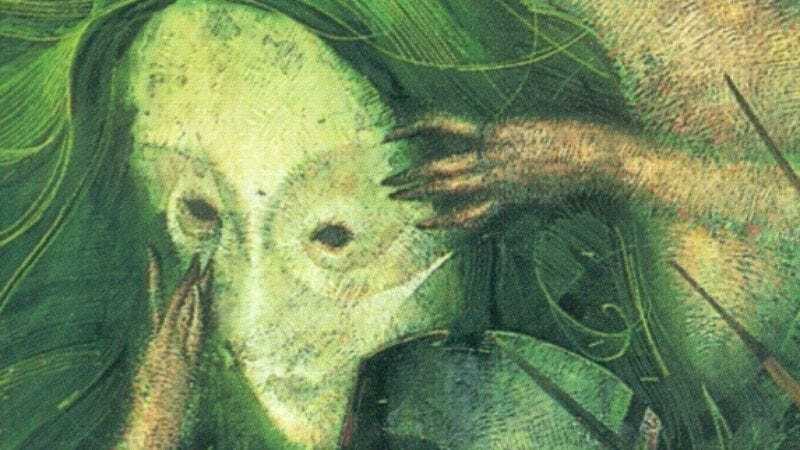 Gaiman has been tweaking superhero convention throughout The Sandman thus far, but “Façade” is perhaps the most blatant, and literal, deconstruction. “Rainie, mythologies take longer to die than people believe,” explains Death (who’s never looked cuter). “They linger on in a kind of dream country that affects all of you.” She’s talking specifically about Ra, who’s responsible for the existence of Metamorphae like Rainie, but she’s also talking about the power of stories, the way they shape our beliefs and lives and very selves. Like many superheroes, Rainie is the product of a mythological context, a normal human who was drawn into another world where sun gods fight serpent gods in never-ending battles (that apparently actually do end after a few millennia). The back pages of Dream Country include the script for “Calliope,” which I mentioned earlier, and Gaiman introduces it by sharing his initial reluctance to print one of his Sandman scripts, saying “it spoils the magic when you know how it’s done.” He’s talking specifically about the construction aspects of a comics script, but the idea of looking at what’s underneath a story applies to the discussion we’ve been having here. Does a story gain or lose power when you see what’s behind it, the deliberation that goes into it? Gaiman is a brilliant writer who imbued Sandman with layers and layers of meaning, but picking apart those layers too much can leave you with a bunch of isolated, flimsy sheets. Noah, I’m curious to hear your impression of Dream Country as a whole, and what effect our dissection of each story has had on that impression. Noah: When we were asked what volumes we wanted to write about, I asked for Dream Country, remembering that I enjoyed Gaiman’s take on Shakespeare and “A Dream Of A Thousand Cats.” But I didn’t notice how these stories are thematically linked on my first read-through. I absolutely love what you said about myths not dying. It’s the same point that “Calliope” makes. I’ve found in our discussion here and my work with Oliver on Preludes & Nocturnes that these books don’t just deepen in meaning when they’re reread. Just talking about them with you has really changed my appreciation. Before, I would have been a little hard-pressed to give a good reason for why these particular four stories are lumped together in one volume, but we’ve come up with lots of reasons. The prevalence of myth runs through them all; even the story the Siamese cat tells is a myth, just one that belongs to a different species. Then there’s the idea of identity, from the cats who dream of being large and powerful, to Rainie and her body in flux. From his introduction, Gaiman seems to suggest that these stories are simply a respite from the larger, more exhausting plots he has in mind, but I don’t think he’s being honest. Each one of these stories deepens Morpheus’ world, and brings to light the themes Sandman will struggle with throughout its run. These aren’t odds and sods; they’re integral. But in terms of talking about them, I actually disagree with the “flimsy sheet” scenario you mentioned (though I don’t assume that it’s necessarily your opinion). For me, picking apart these texts has really changed my thinking about them. As I said above, just discussing them has brought to light a lot of things I missed when reading. When I came into this series, I thought it was great. Now I’d argue that it’s a masterpiece. I think you can run certain texts into the ground, but for me, The Sandman is the gift that keeps on giving, and all of this makes me super-excited for the rest of our series. Next week: Tasha Robinson and Noel Murray extend the discussion of that dream country where mythologies linger on, an idea that hangs heavily over book #4, Season Of Mists.